Now that Fourth Installment of the Indiana Jones Adventures has taken on the official title of Indiana Jones and the Kingdom of the Crystal Skull, speculation about what it might mean runs rampant. And while I’m the first to agree that MTV has been a major (and shameless) accomplice in killing the music industry, one of my favorite movie sites right now is MTV Movies Blog. They got a hilarious interview out of Aaron Eckhart regarding his role in The Dark Knight, and just last week they posted this Terrence Howard interview in which the actor said “fart” three times and was (possibly not) pretending to be fired upon by Bosnians. They’ve consistently provided excellent Indiana Jones coverage, and just yesterday they asked a Harvard professor about just what these crystal skulls might be. The adventure begins here and continues here. 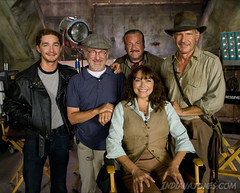 More Indiana Jones news to come. Previous news right here. Indiana Jones had better not drop one of these suckers on his foot on May 22, 2008!